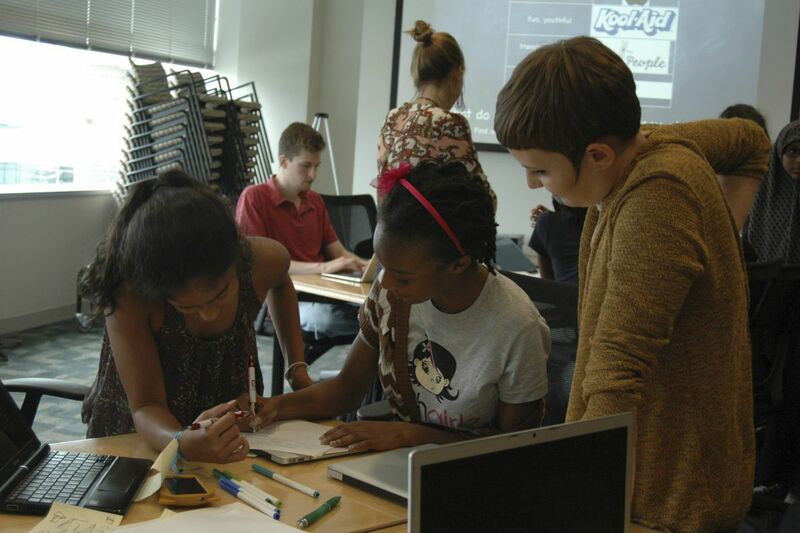 TechGirlz brainstorm at at 2013 summer camp designed to get middle-school girls interested in careers in in technology. Tracey Welson-Rossman, founder of TechGirlz, wanted to run her thoughts by a public relations person before she started venting about the 10-page internal memo that got a Google employee fired Monday night and has raised a ruckus in the tech world. Why? Because the memo made her really angry, and she wanted to respond reasonably. In the memo, posted last week on an internal company message board, Google engineer James Damore says the company has a blind spot when it comes to diversity and that it encourages women to enter technology even though they tend to be more empathetic and less suited for the solitary, technical nature of coding. Also, he wrote, women tend to "neuroticism," with less tolerance for stress, meaning they are more likely to avoid the long hours and anxiety that lead to promotions for executives. Damore confirmed his dismissal in an email, saying that he had been fired for "perpetuating gender stereotypes." Google's Chief Executive Officer Sundar Pichai wrote employees on Monday saying that parts of the employee's memo "violate our Code of Conduct and cross the line by advancing harmful gender stereotypes in our workplace." Damore's post had Welson-Rossman fuming. "For every example he'll put out there, I'll put out 12- and 13-year-old girls who are already learning about coding and who, in 10 years, will out-code him," said Welson-Rossman, chief marketing officer at Chariot Solutions Inc., a software development firm in Fort Washington, who, in 2007, founded TechGirlz to encourage middle school girls to choose technology careers. To her, coding is a key, but narrow, function. "There's user design, there's website design, anything to do with hardware. Hardware is becoming more and more important. Five years from now, we have no idea the path technology is going to take, but it's not just about developing code." The issue is hot enough that the head of the Northeast regional office of Accenture, senior managing director Kathleen O'Reilly, declined comment, even though the software development and consulting company announced recently that it would reach a worldwide gender-balanced workforce by 2025, with women comprising one in four managing directors by 2020. O'Reilly did say a diverse workforce provides a breadth of views necessary for innovation. On Saturday, a few days after the memo appeared internally, Danielle Brown, Google's new diversity vice president, reiterated the company's commitment to diversity, saying that memo "advanced incorrect assumptions about gender." She also said Google valued a safe environment for sharing all points of view, but that discourse needs to comport with the principles of equal employment in the law and Google's code of conduct. The ruckus arises as the tech sector continues to face criticism that its workforce is skewed white, or Asian, and male. Uber's chief executive was forced to resign after stinging allegations arose about how female employees were treated. And several female tech leaders have gone public complaining about gender discrimination in technology. Google has been the subject of a federal Department of Labor probe into whether it is paying female employees less than male counterparts. The company has said its audits show no disparities. So what does the memo signify about Google? "The fact that he wrote 10 pages — this is incredibly well-meaning and I think he loves Google," said Katherine Nelson, who teaches human resources at Temple University's Fox School of Business. "Companies that don't listen [to employees] go down the tubes pretty quickly." But, she said, she disagrees with the gender-stereotypes on technical jobs and leadership positions. She said Google has used mountains of internal data to create eight points of leadership. Only one references technical skill and the rest point to empathy and communication. Yet the memo writer suggests that Google "de-emphasize empathy," which he associates with women. "If Google plays its cards right, this will turn into a win," said Bob Moul, chief executive of Cloudamize, a Philadelphia technology company acquired by London-based Cloudreach last week. "They ought to engage the guy and find out what his concerns are," said Moul, a former chairman of Philly Startup Leaders. "If he feels [Google] programs are discriminatory because he's not the right race or gender to participate in them, that certainly seems to be fair game for discussion. He was pretty brave for writing it. I don't agree with the stereotypes and I certainly don't believe it applies to technology or to leadership. That's a bunch of hooey." Nelson said the employee would have been savvier to take his concerns to a top executive. Google has a left-leaning political mono-culture that imbues its beliefs with the cloak of morality and shames dissenters, particular conservatives. One "moralized" belief is the value of diversity. Women may not advance because men are more willing to put up with the greater stress and longer hours that lead to promotions. Women tend to be more empathetic and agreeable, meaning they may not be as happy in the more solitary work of coding. Google should stop restricting programs to certain sexes or races and should openly discuss the value of all programs, including diversity. "Diversity and inclusion are a fundamental part of our values." "Part of building an open, inclusive environment means fostering a culture in which those with alternative views, including different political views, feel safe sharing their opinions," but alongside principles of equal employment in anti-discrimination laws and Google's code of conduct.